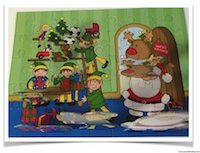 Sometimes less is more...we all know kids can be pretty tough on jigsaw puzzles - they chew them, they lose them and really do try to build them. 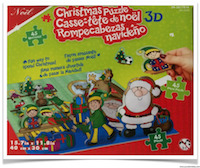 This Christmas 3D adds extra toys into the mix. And by less I mean the price. Since it IS likely this toy will not be long term, the price is right. You can usually buy them at the Dollar type stores. You may as well for you've got a pretty good idea where the future fate of the pieces are going to be. 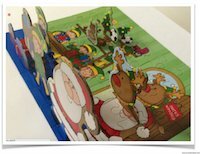 That said, however, if you do want to spend some playtime during the holidays with your little 'tykes' this kids 3D Christmas jigsaw puzzle is ideal. It attracts the child with easy to use slots sliding the pieces into them, making the assembled product a different vision than a basic puzzle. I just love the little pieces that slide onto the 2D portion of the puzzle. That's where the imagination can run wild with Christmas stories with the child. I hope you take the time to create wonderful Christmas memories with your kids. These 3D jigsaw puzzles provide that opportunity.